Once a year Bernhard Fishing one of the largest fishing stores in Switzerland located in Wichtrach open their famous trade fair where not only 10% discount attracts people, but also plenty of exciting shows. Für Deutsch siehe weiter unten! Of special interest for me was the fly fishing show of various instructors such as: Fredi Illien, Hans Spinnler and Thibaut Giband. Latter was the only one I watched the full show. Despite he managed to get full attention by his ability to cast a 5m leader with ease, he showed spectacular casting tricks to avoid obstacles and improve the dead drift with slack in the leader. Additionally, I was astonished by a new method of holding the line in your hand without long loops hanging in the water and therefore avoid adhesion. To do so Thibaut started with two tight loops around his index finger and then winded up the line like an 8 whereas the middle point of the 8 is located between middle and ring finger. This technique is from the Italian fly fishing school and is especially useful in small streams with strong current, because it allows you to adjust the length precisely and play with a sedge fly on the surface more realistic. Inside of the Bernhard Fishing shop fly tying shows took place by Marc Petitjean and Peter Kunz. The former one explained some interesting fact about fly tying with CDC. For example that it is possible to build simultaneously a thorax and legs. This can be done when the CDC fibres are in your thread and you twist it. Thus the fibres stand out of the thread. Then you have to rub half of this twisted CDC between thumb and index finger to clump it a little. This will function as thorax dubbing. Two steps in one. Great. 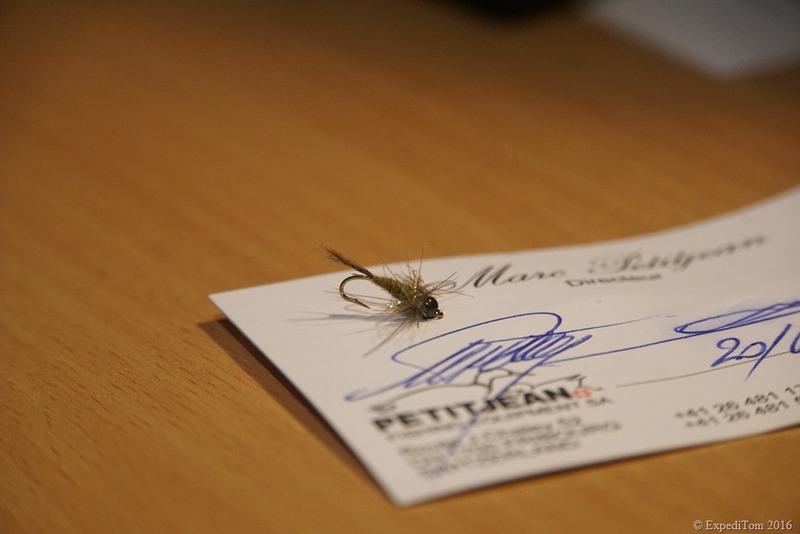 The second thing I learnt from Marc Petitjean was, that you can build up a perfectly conical and segmented nymph or mayfly body by using a whole CDC feather. Just tie it in at the tippet and start wrapping it in from back to the front. Make sure that you turn the feather for every turn you make with your feather around the hook. In the end you just need to cut of the CDC fibres which are too long. In the end I bought various article from UV light and UV glue, Coq de Leon, hackle feathers and heaps of tungsten beads. All in all I can recommend you this trade fair because every time I’ve been there I learnt something new. Alle Jahre wieder organisiert Bernhard Fishing in Wichtrach, einer der grössten Fischerläden der Schweiz die Hausmesse. Dort erwartet die Kundschaft neben 10% Rabatt auch viele aufregende Shows. Mich interessierten im speziellen die Wurfdemos diverser Casting Instruktoren wie zum Beispiel: Fredi Illien, Hans Spinnler und Thibaut Giband. Die Show des letztgenannten war eine sehr eindrückliche Präsentation wie man mit einem 5m Leader mit Leichtigkeit werfen kann und dabei noch Hindernisse locker umwirft. Neben den Casting Tricks zeigte er des weiteren eine mir unbekannte Methode die Reserveschnur zu halten. Man startet indem die Schnur zweimal um den Zeigefinger führt und danach 8-ten fährt, wobei der Mittelpunkt der Acht zwischen Mittel- und Ringfinger zu liegen kommt. Diese Methode kommt von der italienischen Fliegenfischerschule und hat einerseits zum Vorteil, dass keine Schnur im Wasser klebt und andererseits, dass präziser verlängert werden kann wenn es um cm drauf ankommt. Zusätzlich zeigte mir Marc wie aus einer ganzen CDC Feder ein perfekter konischer und zugleich segmentierter Körper gebunden werden kann. Dazu muss nur die Spitze hinten eingebunden werden und nach vorne um den Haken und gleichzeitig um sich selbst gedreht werden. Zuletzt können die überstehenden Fibern gekürzt werden und die Nymphe sieht aus wie auf dem Bild oben. Alles in allem war es wieder einmal eine grossartige Messe wo ich viel dazugelernt und einige neue Dinge gekauft habe wie zum Beispiel UV Leim und Lampe, Tungsten Beads und Coq de Leon Federn.